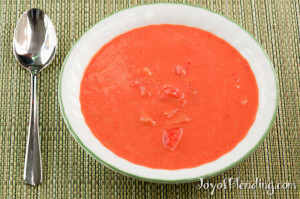 It’s peak tomato season around here, so I highly recommend taking advantage and making some gazpacho. 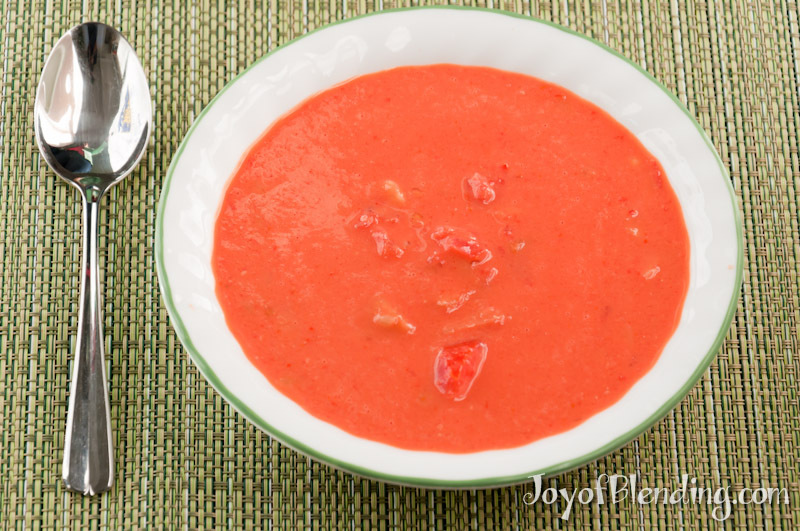 The first recipe that I posted on this blog was a sort of gazpacho, but this one is more traditional and simple. It’s worth trying to find home-grown or farmer’s market tomatoes for maximum flavor. I like to make a smooth base, and then add some tomato and cucumber chunks for texture. Makes 4–5 cups or 2–4 servings. Put all ingredients in container, except reserve 1–2 tomatoes and half of the cucumber. Blend on high until smooth: it won’t take long, maybe 10–15 seconds. Then add the reserved tomatoes and cucumbers (for best results quarter them first), and blend on low speed (variable 1–3) for a few seconds until they are the size you’d like. Serve and enjoy! You could easily substitute other vinegar or lemon juice. Peeling the cucumber is optional, but it helps keep the focus on the tomatoes, both in color and flavor. 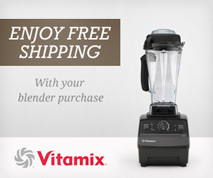 While you don’t really need a Vitamix for this, it makes a nice smooth base, and cleanup is a breeze. I used standard red slicing tomatoes for this, but other tomatoes would work as well. Try to find some that have a nice aroma. And do not store them in the fridge unless you are desperate to keep some over-ripe tomatoes from spoiling, because cold temperature (below 60 °F, according to How to Pick a Peach) destroys a lot of the flavor compounds. I would say tomatoes are the type of produce that has the biggest difference between supermarket and home-grown or farmer’s market. I just saw an interesting NYTimes article about research to try to improve the flavor of supermarket tomatoes. Who knows if they will get anywhere, but at least they are trying. This is really good with about half a red (sweet) onion in it, if you like that sort of thing. Tomatoes really do OK in the fridge. The ideal storage temperature is “cellar temperature” … somewhere in the 60s. But if your house is hot in the summer, it’s much better to store them too cold that too hot. In the fridge, they will lose a bit of vibrance and aroma. In a hot kitchen, they’ll just spoil very quickly.